On 10 May 2017, the European Commission issued the reflection paper on Harnessing Globalisation 1 opening a debate on how to shape globalisation so that it benefits all. The paper underlined the steadfast commitment of the European Union (EU) to build an open, sustainable, fair and rules-based global trade order through international cooperation. However, the EU would not hesitate to act in order to protect its citizens and its industry when foreign countries or companies engage in unfair practices or raise concerns for security and public order. These principles apply fully to foreign direct investment from third countries, which forms part of the EU's common commercial policy. Foreign direct investment is an important source of growth, jobs and innovation. It has brought significant benefits to the EU as to the rest of the world. This is why the EU wants to maintain an open investment environment. At the same time, the reflection paper on Harnessing Globalisation recognised increasing concerns about strategic acquisitions of European companies with key technologies by foreign investors, especially state-owned enterprises. These concerns called into question the capacity of the current regulatory framework to address them. In order to address the potential impact of cross-border takeovers on security and public order, nearly half of EU Member States currently maintain foreign direct investment screening mechanisms and reserve the power to restrict investments that pose a threat to their essential interests. However, despite a clear European dimension to foreign direct investment, there is neither systematic cooperation among Member States nor an EU-wide approach to these issues. This Communication therefore suggests further concrete steps for Member States and, where relevant, the Commission to screen certain foreign direct investments into the EU. 4 It accompanies a proposal for a Regulation establishing a framework to screen foreign direct investments from third countries on grounds of security and public order in the EU, together with a cooperation mechanism among Member States as well as a framework for screening at the EU level. Foreign direct investment flows into the EU have recovered from the lower figures observed during and in the aftermath of the financial crisis, in particular between 2008 and 2010. In 2015, inward foreign direct investment reached almost EUR 470 billion – more than the highest level before the crisis recorded in 2007. 8 The recovery has been supported by an increase in both the number and value of international cross-border mergers and acquisitions, which continue to represent the bulk of foreign direct investment inflows. At the same time, new investment trends are appearing with some emerging economies playing an increasing role as providers of foreign direct investment. 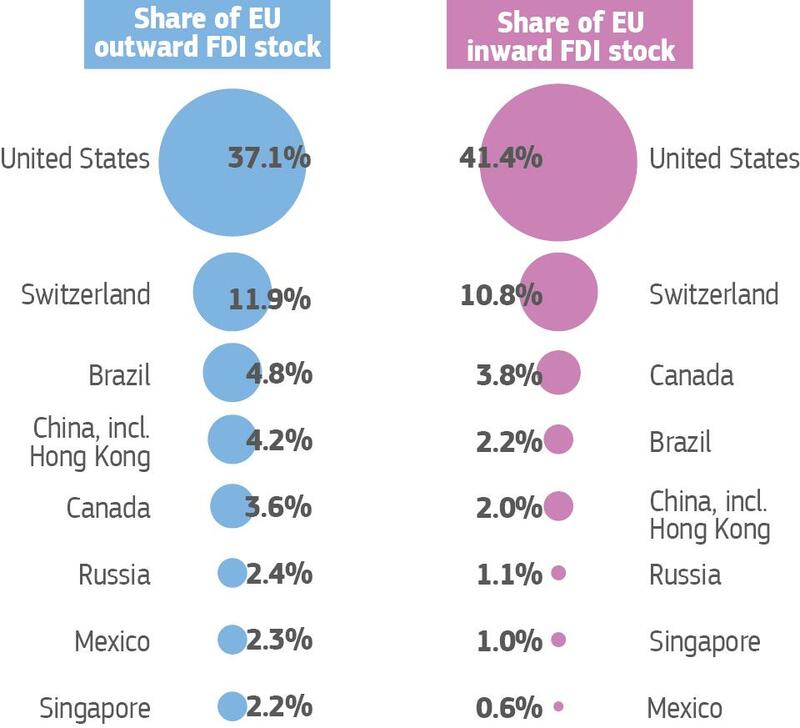 The US remains, by far, the largest foreign investor in the EU but its share in the foreign direct investment stock in the EU fell from 51.3 per cent in 1995 to 41.4 per cent in 2015. Japan’s share also declined from 7.7 per cent to below 3 per cent in the same period. At the same time, the shares of Brazil and China have increased significantly from respectively 0.2 and 0.3 per cent in 1995 to 2.2 and 2 per cent in 2015, 9 making these two countries the fifth and sixth largest foreign investors in the EU (see charts below). The EU welcomes foreign investments because of the substantial benefits they bring for our economy and society at large. Foreign direct investment is a source of growth and jobs. It links EU companies with global value chains that drive the modern economy. It boosts productivity and makes our companies more competitive by improving resource allocation, bringing in capital, technologies and expertise, increasing competition, stimulating innovation, and opening new markets for EU's exports. Furthermore, it supports the objectives of the Investment Plan for Europe, and other EU projects and programmes. Outward foreign direct investment generates similar gains as inward flows, including for the implementation of the 2030 Agenda for Sustainable Development. For all those reasons, the EU will continue to support liberalisation and protection of investments worldwide. EU openness to foreign investment is not going to change. However, it has to be accompanied by vigorous and appropriate policies to, first, open markets for EU companies in third countries, ensure that everyone plays by the same rules and protect EU investments in third countries, and, second, to protect assets in the EU against takeovers that could be detrimental to the essential interests of the EU or its Member States. Foreign investors are increasingly focused on seeking new markets and strategic assets and State-Owned Enterprises play a growing role in the global economy. 12 In some economies State-owned Enterprisesundertake a significant share of outward foreign direct investment, in some cases as part of a declared government strategy. 13 Beyond direct state ownership in enterprises, we also witness situations whereby certain companies are directly or indirectly influenced by the state through various means, or where the state facilitates foreign take-overs by national companies, notably through facilitating access to financing below market rates. In this context, there is a risk that in individual cases foreign investors may seek to acquire control of or influence in European undertakings whose activities have repercussions on critical technologies, infrastructure, inputs, or sensitive information. This risk arises especially but not only when foreign investors are state owned or controlled, including through financing or other means of direction. Such acquisitions may allow the States in question to use these assets to the detriment not only of the EU's technological edge but also its security and public order. Several of the EU's key international partners have established and operate foreign direct investment screening mechanisms, in order to address these types of concerns. These include Australia, Canada, China, India, Japan and the United States. Since 1975, the Committee on Foreign Investment in the US (CFIUS) monitors and screens transactions that could result in control of a US business by a foreign person in order to determine the effect of such transactions on national security. As an inter-agency service, CFIUS has the authority to formally review foreign direct investments, while the Foreign Investment and National Security Act of 2007 also requires heightened scrutiny of foreign government-controlled transactions. Between 2009 and 2014, CFIUS received 627 notices of proposed acquisitions of US companies by foreign firms, formally investigating around 40% of this total: of these 244 investigated transactions, 47 (or around 7% of screened deals) were cancelled by the companies involved during the investigation period and one was cancelled by Presidential decision after the CFIUS investigation. Under the 1975 Foreign Acquisitions and Take-Over Act certain proposed foreign investments have to be notified and must receive an approval (a no-objections notification) before they can proceed. The screening, conducted by the Treasurer (Minister responsible for government expenditure) advised by the Foreign Investment Review Board, is based on a national interest test. Sectors identified as sensitive in this context include media, telecom, transport, defence related industries, and the extraction of uranium and plutonium as well as nuclear facilities. Notification requirements vary depending on, inter alia, the sector, the type and value of the acquisition, free trade agreements and whether the investor is private or government. The establishment of a level playing field with third countries with regard to investment conditions is paramount. The EU's trade and investment policy 15 is the most appropriate tool to ensure that third countries offer a level of openness for foreign investment equivalent to that of the EU and to promote a level playing field for EU operators. The EU is pursuing bilateral or regional agreements encompassing binding rules and commitments on foreign investment, notably foreign direct investment, with a wide range of partners. 16 These agreements ensure in particular that EU investors benefit from a clearer legal framework and better access to foreign markets. Moreover, the Commission seeks provisions to safeguard intellectual property, increase transparency and limit particularly trade-distortive subsidisation, and discipline the behaviour of state-owned enterprises. The key achievements in ensuring a more open, fair and rules-based trade and investment environment are highlighted in the Commission's Communication "A Modern Trade Policy to Harness Globalisation" and a Report on the implementation of the EU trade strategy "Trade for All" which were adopted alongside the present Communication. Also in this context, the EU attaches utmost importance to multilateral cooperation and rule making. The World Trade Organisation's General Agreement on Trade in Services (GATS) contains detailed rules on the establishment of foreign services providers, covering market access as well as non-discrimination commitments, and rules on the liberalisation of capital movements exist under the Code of Liberalisation of Capital Movements of the Organisation for Economic Cooperation and Development (OECD). It is important to note that these international trade and investment agreements concluded by the EU and its Member States provide for exceptions from the national treatment and market access obligations allowing signatories to take measures to protect security interests or public order, provided those measures do not constitute an arbitrary or unjustifiable discrimination or a disguised restriction on trade. The G20 adopted, in 2016, Guiding Principles for Global Investment Policymaking 17 , which call for open, non-discriminatory, transparent and predictable conditions for investment. In 2017, G20 members again underlined the importance of reciprocal trade and investment frameworks and their commitment to work towards a level playing field. The EU will continue its efforts at bilateral and multilateral level to ensure that third countries offer a level of openness for foreign investment equivalent to that of the EU and maintain a level playing field for EU operators. The EU also supports discussions in the World Trade Organisation on investment facilitation. Nearly half of EU Member States have in place mechanisms for screening foreign direct investments. This is the case for Austria, Denmark, Germany, Finland, France, Latvia, Lithuania, Italy, Poland, Portugal, Spain, and the United Kingdom. Member States follow different approaches as regards the exact scope and design of the screening procedures. As regards the scope, most existing screening mechanisms apply to both intra-EU and extra-EU investments, while some apply to investments from third countries only but may include anti-circumvention provisions to prevent abuse. In some cases, the screening mechanisms cover investments in specific sectors considered strategic (e.g. energy, telecommunication, transport) while in others there is no limitation to specific sectors. Investments covered by the screening mechanisms are normally qualified by qualitative criteria (e.g. gaining control over the target company) and/or quantitative thresholds (i.e. percentage of shares or voting rights). In terms of the grounds for screening, some screening mechanisms are limited to the protection of essential interest of national security, especially production of or trade in arms, munitions, military equipment, war material, etc. However, most go beyond the defence sector and are mainly related to the protection of public security and public policy or public order. As regards the design of the screening procedures, there are two main types of mechanism: those requiring investors to notify an investment covered before it is made and providing for a prior authorisation system and those providing for an ex-post control of investments already completed, with the possibility for investors to voluntarily submit the investment to screening before it is finalised. The national screening mechanisms represent a restriction to free movement of capital or freedom of establishment, in particular as regards intra-EU investments. 18 However, the Treaty allows Member States to take measures restricting these freedoms provided that they are non-discriminatory on grounds of nationality, and can bejustified in particular on public security or public policy grounds or for other overriding reasons in the general interest as defined by the Court of Justice, and comply with the principles of proportionality and legal certainty. A number of EU policies contribute to ensuring the benefits of foreign investment while limiting the associated risks. First and foremost, it is a fundamental obligation that all foreign investors in the EU comply with applicable EU and national laws. This includes the EU competition rules, which include the control of mergers and acquisitions. When a proposed investment, whatever its source or origin, falls within the scope of the EU Merger Regulation 19 , it cannot go ahead without prior review and approval by the European Commission. The aim of this procedure is to prevent concentrations that would significantly impede effective competition in the internal market. The assessment of the compatibility of a notified concentration carried out under the EU Merger Regulation focuses solely on competition and does not take into account security or public order concerns. ·Some EU legislation directly addresses the impact of foreign ownership. Legislation regarding foreign control over certain European assets already exists in very specific instances, in particular where the EU defines criteria for authorisation of operators based, inter alia, on the nationality of ownership. For instance, an air carrier cannot be licensed in the EU if 50 per cent or more of its shares are owned by non-EU persons, unless an agreement exists with its home country. 23 In the same vein, in accordance with EU energy rules, a gas or electricity transmission system operator controlled by a third country cannot operate in the EU unless it has been demonstrated in the process of certification that it will not put at risk the security of energy supply to the Member State in which it would operate or to the Union. 24 Another example are EU rules for granting and using authorisations for the prospection, exploration and production of hydrocarbons 25 which provide that Member States may, on grounds of national security, refuse to allow access to and exercise of these activities to any entity which is effectively controlled by third countries or third country nationals. However, in spite of these sectorial initiatives, there is, so far, no comprehensive legal framework at the EU level which addresses the security and public order risks that certain foreign direct investment from third countries may pose. The Commission fully acknowledges the need to maintain the necessary flexibility for Member States to screen foreign direct investments, taking into account their individual legitimate interests, different situations and national circumstances. At the same time, the European dimension of foreign direct investment is obvious, which is why it falls under the EU's Common Commercial Policy. 28 Within the Internal Market, EU companies increasingly make use of the freedom of establishment and to provide services as well as of the free circulation of goods and capital, spreading their activities and their supply chains over several Member States, rather than operating in just one. Third country investors also wish to reap the benefits of the Internal Market by investing in EU companies, which affords them considerable economies of scale and access to the Internal Market. Moreover, a foreign direct investment in one Member State may have implications for the security or public order of another Member State or for the EU as a whole. Such cross-border impact cannot always be fully considered and assessed within national mechanisms. Moreover, there is a need to ensure a framework that protects assets that have a significant European dimension given their links to programmes or projects of Union interest such as, for instance, the European global satellite-based navigation system (Galileo). The Commission considers that closer cooperation and better coordination between Member States is essential to respond to the changing investment landscape and to enhance synergies between the respective prerogatives of the EU and Member States. The Commission therefore suggests taking further measures as regards those investments from third countries that may raise security and public order concerns. •prevent circumvention of national foreign direct investment screening mechanisms. Such action will be taken in full respect of obligations arising from the EU Treaties and international agreements and arrangements to which the EU and Member States are party. In this regard, where the EU or Member States have assumed international commitments on investment, the scope for action is already framed by the corresponding security and public order exceptions. In parallel to this Communication, the Commission, in light of the above and acting on the basis of Article 207 TFEU, is putting forward a proposal for a Regulation establishing a framework to screen foreign direct investments in the EU. The proposal establishes a framework for the screening of foreign direct investments into the EU on grounds of security or public order, while providing a non-exhaustive list of factors that may be taken into account in determining whether a foreign direct investment may impact security or public order. It establishes essential elements of the procedural framework for the screening of such foreign direct investments by Member States, including transparency obligations and the obligation to ensure adequate redress possibilities with regard to decisions adopted under these screening mechanisms. At the same time, the proposal maintains the necessary flexibility for Member States in screening foreign direct investments, allowing them to adapt to changing circumstances and their national specific context. The draft Regulation also establishes a mechanism for cooperation between Member States, notably for the cases where foreign direct investment in one or more Member States may affect the security or public order of another Member State. Finally, the draft Regulation provides the Commission with the means to screen foreign direct investments that may affect projects or programmes of Union interest on grounds of security and public order. The proposed Regulation sets out criteria for the identification of such projects or programmes, examples of which include Horizon 2020, Galileo and European Geostationary Navigation Overlay Service (EGNOS), Copernicus, and the Trans-European Networks for Transport (TEN-T), Energy (TEN-E) and Telecommunications. 1.Carry out by the end of 2018 further in-depth analysis of foreign direct investment flows into the EU, especially in strategic sectors (e.g. energy, space, transport) or assets (technologies and inputs linked to strategic sectors, critical infrastructures across sectors, sensitive data) that may raise concerns in the areas of security, public order and/or control of critical assets, in particular when the investor is owned or controlled by a third country, or benefits from significant state subsidies. This will include, in cooperation with Member States, data collection at the most granular level available, analysis of trends, and assessment of impact, including through case studies. As necessary, it will encompass a further study to identifycritical assets. The role of state support in facilitating acquisitions will also be assessed. •following the entry into force of the proposed Regulation, consider any question relating to its application. The Commission remains convinced of the benefits of foreign direct investment and the decisive contribution such investments have made to higher growth levels and creation of quality jobs in the EU. The Commission also believes that an open investment environment contributes to sustainable development worldwide. The EU will therefore remain the staunchest defender and promoter of an open and rules-based international investment environment. Through its trade and investment policy, the EU will continue to insist that third countries offer a level of openness for foreign investment equivalent to that of the EU and maintain a level playing field for EU operators. However, it is also clear that the EU and its Member States must be in a position to take determined and swift action where foreign direct investment may affect security or public order. For this reason, the Commission is presenting a legislative proposal alongside this Communication. The evolving international context calls for action by the European Parliament and the Council in order to ensure a rapid legislative process. In parallel to the negotiation of the Regulation, the Commission will, within the existing framework and in line with section 6.2.b of this Communication, pay particular attention to foreign direct investments that may threaten security or public order and examine the situation in close cooperation with the Member States. Member States are invited to contribute actively to this cooperation and to the tasks of the coordination group that the Commission will establish in this respect. COM(2017) 240 of 10 May 2017 "Reflection Paper on Harnessing Globalisation"
European Parliament Resolution of 5 July 2017 on building an ambitious EU industrial strategy as a strategic priority for growth, employment and innovation in the EU. Moreover, a proposal for a Union Act on the Screening of Foreign Investment in Strategic Sectors is currently under discussion in the European Parliament's Committee International Trade (European Parliament 2014-2019, B[8-0000/2017] of 20.03.2017). This Communication concerns only foreign direct investment from non-EU countries and does not cover portfolio investment. Articles 63 and 206 TFEU. Data excludes investment through Special Purpose Entities. UNCTAD "World Investment Report 2017: Investment and the Digital Economy"
THE COUNCIL on Trade and Investment Barriers, 1 January 2016 - 31 December 2016"
Free trade agreements are at various stages of discussions with Australia, Canada, Chile, India, Indonesia, Japan, Mercosur, Mexico, Morocco, New Zealand, Philippines, Singapore, Vietnam, and Turkey. The EU is also negotiating stand-alone investment agreements with China and Myanmar. Articles 63 and 49 TFEU. Council Regulation (EC) No 139/2004 of 20 January 2004 on the control of concentrations between undertakings (OJ L 24, 29.1.2004, p. 1). These sectors are energy, transport, banking and financial markets infrastructure, health sector, drinking water supply, and digital infrastructure and service providers. The new Regulation repealing Regulation (EU°) No 994/2010 is currently in the adoption process and is expected to enter into force in autumn 2017. For electricity, COM (2016)862 Proposal for a Regulation of the European Parliament and the Council on risk-preparedness in the electricity sector repealing Directive 2005/89). ln particular Case C-483/99, Commission v France, Case C-463/00, Commission v Spain, Case C-326/07, Commission v Italy, Case C-212/09 Commission v Portugal, and Case C-244/11 Commission v Greece.